Having returned from Furano to Sapporo, I needed to get back to Tokyo in time to fly back home. There’s one simple and obvious way to do that: domestic flights from New Chitose airport to Haneda run just about every 30 minutes, take 90 minutes, and aren’t too expensive. Instead, I took a 16 hour long journey on a slightly knackered night train. 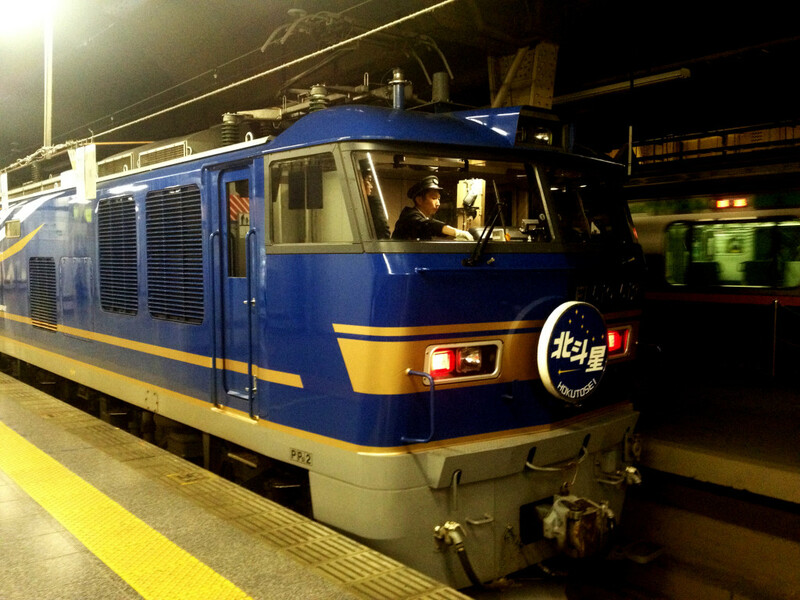 The Hokutosei, which runs from Sapporo to Ueno and back, is one of a dying breed of ‘blue train‘ sleeper trains. 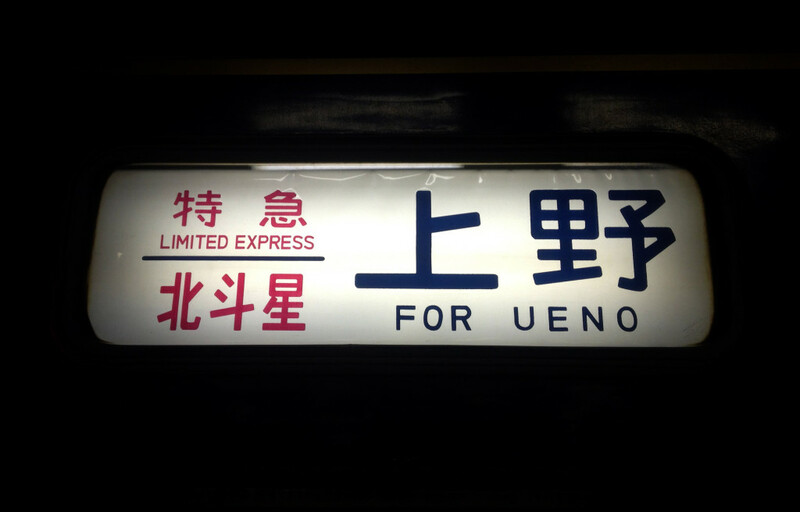 Once to be found all over Japan, with more than 25 services, they’re now down to four – all of which are due to be stopped soon, making them popular with the nostalgic and trainspotters alike. And with one of them running exactly where I wanted to go, I figured I’d catch one while I could. Besides, anything’s more fun than an airport, right? I arrived back in Sapporo after stopping overnight in Asahikawa*, and already prepared with a ticket for the night’s train, which leaves at about 5pm from Sapporo’s main JR station. Tickets present something of a problem for tourists: you’ll absolutely need to have one in advance – and they sell out pretty quickly – but that leaves you with a choice of booking online and paying full fare, or booking late using a Japan Rail Pass to cover most of the cost. I did the latter, paying about £60 for my berth a week before departure. 1) Royal. Ludicrously expensive (about 18,000 yen just for the room), and there are only a few of these. 2) Twin Deluxe. Apparently these have sinks. About 14,000 yen for the two of you. 3) Duet – a normal twin room for around 12,000 yen. 4) Solo – a normal single compartment for the standard fare of around 6500 yen. 5) B class berth – one of four beds in a shared compartment, which bizarrely costs the same as a Solo room. Having booked late, guess where I ended up. Waiting for the train, I noticed a trend: everyone waiting to board was either three times, or half, my age: with the exception of one particularly earnest train enthusiast, everyone else was either a pensioner or looked like a broke student. But no matter, because at that point a huge – and, yes, really very blue – train clanked into the station. People rushed to the front to take photos, and I followed to take a look, only to be a bit surprised – in the place of the boxy electric train I’d expected, it was being towed by two giant, chuffing diesel contraptions that looked like they should be pushing heavy goods. Turns out the service has to change trains somewhere en-route (I’m guessing near Aomori) as it moves onto electrified lines, every single trip. But I had to get on board, and find my berth. It turned out to be in the car nearest to those two giant diesel monsters (makes sense, I suppose – the posh rooms get the quiet end), and in a room shared with two very polite, and very quiet, students – one of whom seemed to fall asleep pretty much as soon as the train started rolling. The amenities of a B class berth, as pictured above, are: some space in the luggage store above the compartment door (that’s my backpack), a light with two settings, a sheet and duvet, a huge pink curtain that pulls around the bed to give you some privacy, and a JR-branded yukata. The bed itself is fine, if not quite long enough for me to lie down straight. You can sleep in it, but you won’t want to pass all 16 hours there. I made for the lounge. 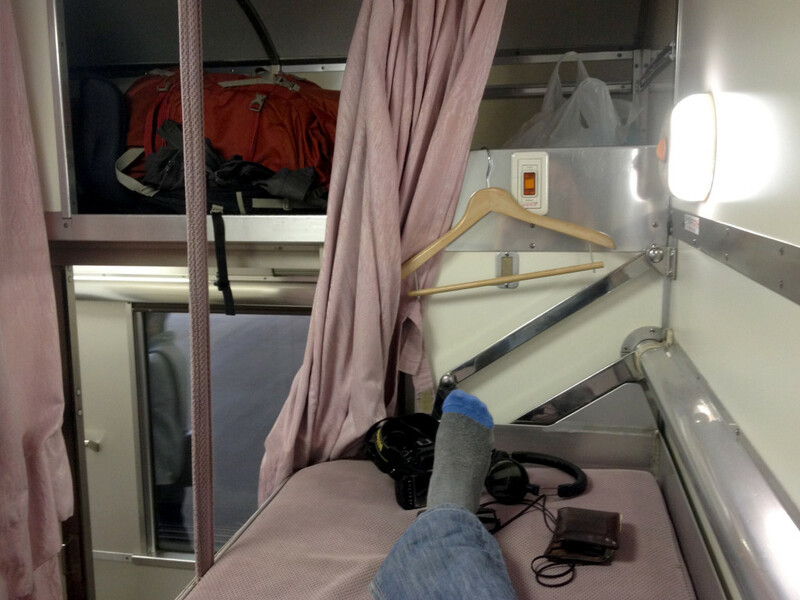 The Hokutosei has a lounge car, a dining car and a vending machine – all of which are found at the posh end of the train, so to get there I had to wobble down something like ten corridors, and between a lot of carriages. This gives you a pretty good overview of the train’s fittings: the cheap bit seems to have emerged unchanged from the 1970s, while the posher areas must be a decade newer maybe. If you can’t use a Japanese style toilet in a train that’s jumping around from side to side, you’ll need to avoid the cheap berths. The lounge car has seating for maybe 20 people at most, with some tables on one side and a long bench table down the other side. On my trip, it was mostly empty, except for the young train enthusiast, who sat by the door, greeting everybody with the same “北斗星、最高ですね” (The Hokutosei, isn’t it the best?”) – even if it was the second time in as many minutes that they’d passed by. そうですね、we all agreed, all the time. Isn’t it just? At one point, I tried to strike up a train-related conversation: what about the new Shinkansen service, wasn’t that due to start quite soon? Oh, he explained, the Shinkansen isn’t the same. Train-fans aside, people who had compartments tended to stay in them, except for a brief crowd just before “Pub Time” – when you can buy food without a reservation – opened in the restaurant. 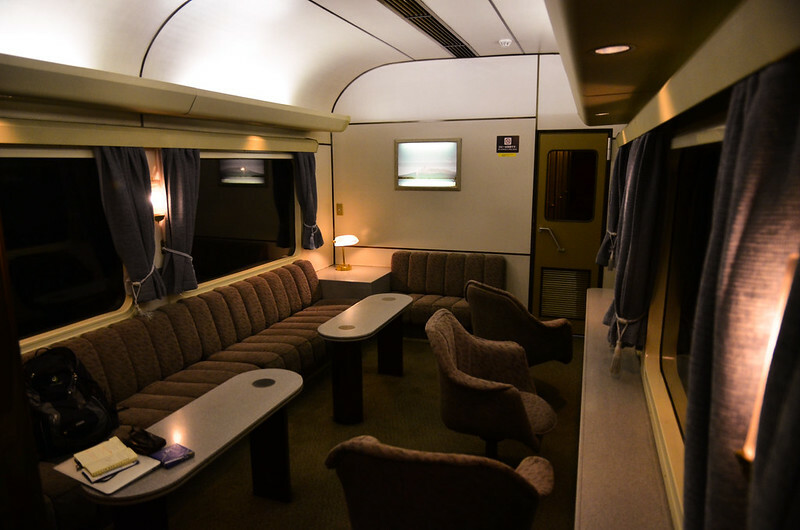 The near end of the lounge car, from where this photo was taken, also holds the train’s other key amenity: showers. A few hundred yen buys you a little magnetic card, and a half hour timeslot in one of the two showers – during which you’ll get six minutes of hot water (a red LED countdown keeps you on your toes). You need to take a towel and wash kit. And beyond that, there’s the restaurant car. In the early evenings, this is the “Grand Chariot” restaurant, for which you’ll need a reservation weeks in advance – one of the men on the train, who didn’t have a reservation, was very excited to have obtained the menu card for that evening. After that it’s the aforementioned “Pub Time”, which attracted a rush of pensioners, and in the morning you can buy a pretty decent breakfast for £15 or so, killing 45 minutes as you do – no reservations required, but there aren’t many seats (I’d guess around 20) so it gets quite crowded. Outside of those hours, the restaurant sells the shower cards, and there’s also a trolley that rattles through the train selling beer and snacks – oddly, though, no booze in the vending machine. More surprisingly, a JR man passed through the train selling Hokotosei souvenirs – wallets, keyfobs, and the like – attracting plenty of business. After maybe five hours in the lounge, watching the sun set somewhere near Toyako and then nursing a book and a beer, I hit the sack – and, with the aid of alcohol and earplugs (grabbed some in Sapporo, in anticipation of a long, noisy night), I was surprised to wake up fairly refreshed around 7am as the light bled through the curtains. The train makes a few stops as it heads down Honshu – you could disembark at Sendai, for example, if you could wake up on time – but the last four hours or so see it rumbling through the outskirts towards Ueno. People shuffled up and down the carriages in pyjamas, watched their watches, clicked away on cellphones. It’s about this point that you realise that you could have just woken up in Sapporo, nipped to the airport from there, and you’d still beat the train to Tokyo. But that wasn’t ever really the point. As I dragged my backpack off the train at Ueno station, a crowd of people had gathered to take photos of its arrival, and I had begun to see why: like the Hakkoda Maru before it, the Hokutosei is a service out of time – a fixture for decades, but soon to be gone and largely forgotten. Because, like he said, it won’t be the same. Update: 22 August 2015　ーLast week I heard via Twitter that, following a year or so of reduced service, the very last Hokutosei service – the ラストラン, or “last run” – would be today, and that tickets for the final trip had sold out in seconds from the JR ticket windows once released. Looking online, it’s touching to see that crowds gathered to bid it farewell, and to wish the service (and its crew) thanks for years of service. So long, then, to the Hokutosei – a service out of time, no doubt, but I feel lucky that I managed to take a trip while I had a chance. * Asahikawa has a zoo (I’m not really keen on zoos), an enormous and brand new JR station roughly the size of Paris and a bus system so fantastically complicated that, after two hours attempting to make my way to the Yukaraori cultural museum outside town, I gave up and decided to just find an izakaya. If you do find yourself there, a word of warning: the ‘Buses by location’ sign in English is hopelessly out of date – ignore it (and the buses in the direction of the Yukaraori leave from the a stop just in front of the Chuo highway bus terminal).